Martin was born in Sheffield into a musical family: his great-grandfather was leader of the Liverpool Philharmonic Orchestra, and his great-uncle was principal viola player in the BBC Philharmonic for thirty-five years. His father, violinist Peter Cropper, founded the Lindsay Quartet and his mother is the violin teacher, Nina Martin. Until the age of five he thought everyone played the violin! He began lessons with his mother until he was awarded a scholarship to study with Howard Davis at the Royal Academy of Music. Martin is passionate about chamber music and has been fortunate to study and perform with some of the world’s most inspiring chamber musicians. He has played many of the major concertos with orchestra and continues to enjoy sharing music throughout the UK and beyond. 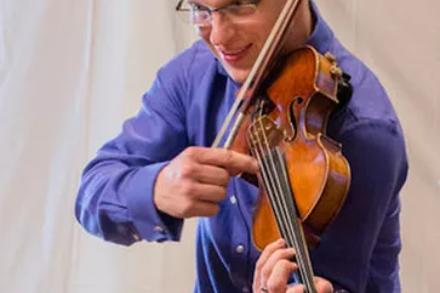 Martin has always been interested in education, and has taught the violin since he was 16. He enjoys a varied career and shares his energy and enthusiasm for music between Oakham School, Rutland where he is now in his eleventh year as Head of Strings, and Sheffield’s Music Academy where he was recently appointed Musical Director. Martin also enjoys a long standing relationship (22 years) with CSYO and regularly gives workshops for Music in the Round and the European String Teachers Association (ESTA).